Mrs Gulnaz Shehzadi wife of Mr Shujaat Ali Shah was born on April 18, 1968 in Lahore. She obtained the degree of B.Sc(Chemistry, Zoology & Botany) in 1987 and the degree of B.Ed in 1989 from University of the Punjab, Lahore. She was active in politics while studying in college and was a student leader. An educationist and a business lady, who has been elected consecutively second time as Member, Provincial Assembly of the Punjab in general elections 2018 against one of the seats reserved for women. She served as Science Teacher in Aitchison College, Lahore during 1987-93. She is the owner and administrator of two projects of Punjab Group of Colleges. She has authored a book titled "Magic of Letters" which helps to develop and enhance pronunciation skill of children as well as helps in building blocks of words. Since 1998, she has been setting up free summer camps during vacations in remote areas with the aim to reduce illiteracy rate and to connect with the community of children. She is working effortlessly and tirelessly for the promotion of education. She has the honour to serve as Member, Working Council and Divisional Coordinator of First Women Parliamentary Caucus Punjab; and as Member, Sustainable Development Goals. She participated in International Visitor Leadership Program held in USA in collaboration with United States Department of State Bureau of Educational and Cultural Affairs. She also visited Bangkok in 2017 and on invitation attended a workshop from 20 to 23 March organized by Global Resilience Academy (GRA) as a Resource Person for the city of Sialkot. She has been serving as Member, Miners Welfare Board since March 2016. She has visited South Africa, UAE and Saudi Arabia. 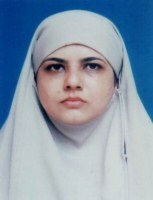 Her husband has served as Member, District Council during 1998-99 and as Tehsil Nazim, District Sialkot during 2000-02. He was a ticket holder for PML(N) from PP-125 in General Elections 2002 and is currently functioning as Secretary General, PML (N), District Sialkot.